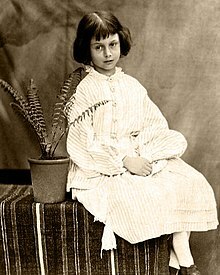 Alice Pleasance Hargreaves, née Liddell (/ˈlɪdəl/; 4 May 1852 – 16 November 1934), was, in her childhood, an acquaintance and photography subject of Lewis Carroll (Charles Lutwidge Dodgson). One of the stories he told her during a boating trip became the children's classic Alice's Adventures in Wonderland. Although she shared her name with the heroine of the story, scholars disagree about the extent to which the character was based upon her. She married cricketer Reginald Hargreaves, and they had three sons. For most of her life, Alice lived in and around Lyndhurst in the New Forest. After her death in 1934, she was cremated at Golders Green Crematorium and her ashes were buried in the graveyard of the church of St Michael and All Angels Lyndhurst. A memorial plaque, naming her "Mrs. Reginald Hargreaves" can be seen in the picture in the monograph. Alice's mirror can be found on display at the New Forest Heritage Centre, Lydhurst, a free museum sharing the history of the New Forest. In the television show, Warehouse 13, Alice Liddell is a character whose spirit is trapped in Lewis Carol's mirror and causes trouble by possessing people. She is portrayed as a homicidal maniac that killed many people (including her own mother which lead to her madness) before being trapped in the mirror. His back story is revealed in the episode Fractures. Polish fantasy writer Andrzej Sapkowski wrote a fantastical story entitled "Złote Popołudnie" (Golden Afternoon, after the poem that opens Alice's Adventures in Wonderland) according to which all that happened in Wonderland was a fever dream of Liddell. ^ This phonetic version of her name, with emphasis on first, rather than second syllable as sometimes mispronounced, is confirmed by the rhyme current in Oxford at the time (attributed by some to Dodgson himself but called by others a piece of "undergraduate doggerel"): "I am the Dean and this is Mrs Liddell. She plays the first, and I the second fiddle." Quoted in Naiditch, P. G. (1993). "On Pronouncing the Names of Certain British Classical Scholars". The Classical Journal. 89 (1): 55–59. JSTOR 3297619. ^ "Nelson Evening Mail, Volume XI, Issue 233, 22 September 1876, P.4, quoting Home News, 1876". Retrieved 5 August 2010. ^ "lyndchur". Southernlife.org.uk. Archived from the original on 17 May 2011. Retrieved 22 March 2014. ^ "Call to celebrate life of the 'real Alice' (From This is Hampshire)". Thisishampshire.net. 8 March 2010. Retrieved 22 March 2014. ^ Douglas-Fairhurst, Robert (2015). The Story of Alice: Lewis Carroll and the Secret History of Wonderland. Harvill Secker. ISBN 1846558611. ^ Cohen, Morton Norton (1996). Lewis Carrol: A Biography. Vintage. ISBN 0679745629. 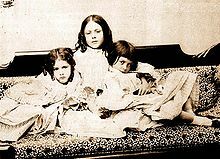 ^ "Lewis Carroll (Charles Lutwidge Dodgson) Photography Collection". Harry Ransom Center. Retrieved 27 April 2017. ^ a b "The Lewis Carroll Society Website - Charles Dodgson's Diaries". 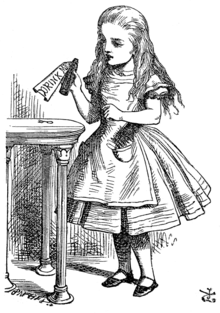 The Lewis Carroll Society Website. The Lewis Carroll Society. Retrieved 26 April 2017. ^ "Cut pages in diary". 4 March 2004. Archived from the original on 14 June 2006. Retrieved 9 July 2006. ^ www.xuni.com (12 January 2010). "Author Melanie Benjamin". Melaniebenjamin.com. Retrieved 22 March 2014. ^ Hoyes, Rachel (1 July 2015). "The Looking Glass House by Vanessa Tait, review: 'extensively researched'". ISSN 0307-1235. Retrieved 9 December 2017. Wikimedia Commons has media related to Alice Liddell.